cheating and spurring economic growth. If the White House would agree to count that money, the Republican leaders said, then they might have a deal. 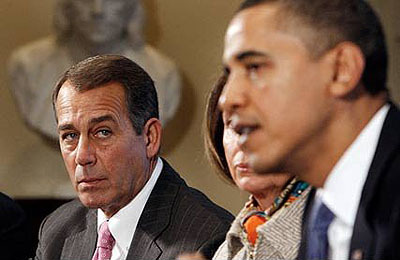 Late last Sunday morning, House Speaker John Boehner and his No. 2, majority leader Eric Cantor, found themselves in White House Chief of Staff Bill Daley’s West Wing office talking with Treasury Secretary Tim Geithner about how tax reform, if done right, could produce $800 billion in new revenues over the next 10 years through growth and by closing loopholes. Sensitive to an anti-tax promise taken by most of the House Republicans, the negotiators felt this would be a way to raise revenues without breaking the pledge. In other words, Cantor was hellbent on raising revenue without breaking the Republicans’ no-higher-taxes pledge. Instead, some of the additional revenue would come via higher growth and some would come from broadening the tax base by closing loopholes and reducing tax expenditures. Did they end up agreeing on this? Nobody knows. To be honest, I’m not sure there’s anything new in the WaPo piece. There are a few details here and there, and a bit more recreated dialog, but nothing substantive. It’s the same story we’ve heard from the very beginning: It was a lousy deal; the revenue increases were dubious; it got derailed after the Gang of Six released its plan and Obama asked Boehner for more revenue; and it got scuttled completely when Boehner refused to accept Obama’s offer to go back to the original deal. Unless I’m missing something, we already knew all this.